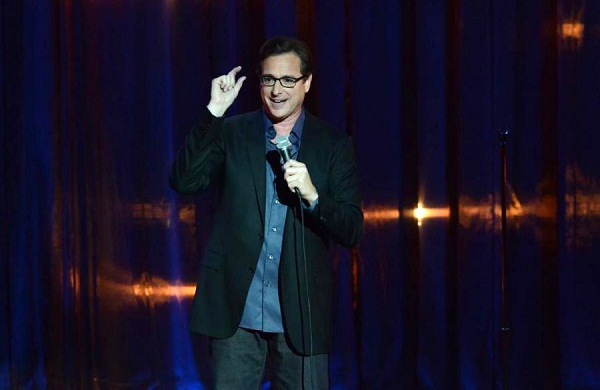 Anyone who first knew Bob Saget as Full House’s squeaky clean Danny Tanner may have gone into shock the first time they heard him telling dirty jokes during a standup set. Over several decades, Saget has cultivated a persona that’s equal parts wholesome (America’s Funniest Home Videos) and filthy (The Aristocrats, Entourage). In his new memoir, Dirty Daddy, the Grammy-nominated comedian and real-life dad speaks to the events and influential performers who shaped to his occasionally clean and often irreverent sense of humor. Listen to the audio portion to hear more of what Bob Saget has to say. VOICE RECORDING PROGRAM: This call is now being recorded. BOB SAGET: She sounded hot, that woman that prompted. Do you have her number? GROUPON: I can look that up for you, for sure. BS: You know you got a problem if you’re driving and your GPS woman is turning you on. That’s a problem. G: We read Dirty Daddy, and thought it was very funny, but also surprisingly sad. Tell us a little about how the book came to be. BS: I worked for a year and a half writing it. And it was what I wanted to write about. It has observational comedy in it, it has some stuff that’s in adult language, and it’s also about death, because I’ve lost a lot of people in my life. My parents lost four children, and since I was about 9, someone died every year. And then I became a film student and a comedian, and I was friends with a lot of comedians, and then a lot of comedians died. It’s all about surviving, and how you get through it all. And so the book is kind of a culmination of all those things. It’s about comedy, and death, and my, ah, lower parts. G: How did the writing process differ from that of writing jokes? BS: I write jokes, but a lot of it is just writing as I’m walking. I’ll record it into the audio notebook on my phone. That’s how I’ve been working for 10 years. But this required discipline. And when I first got the book deal, they said, well, “You’re going to be able to write four hours a day, like a writer?” And I said, “Absolutely.” And then five weeks go by and you have not done your four hours of writing a day, and you start to cram. G: You’re doing a bunch of appearances to promote Dirty Daddy, which will take you all over the country. What’s your favorite comedy city? BS: That’s interesting. Where are you guys based? G: Chicago. BS: Oh, I would say Chicago, then. G: Somehow I thought that might happen. BS: I fluff the city I’m in. I’m a city fluffer. There’s actually a website now, it’s like OpenTable, it’s called CityFluffer, and what you do is, you aggrandize the cities you’re in. I loved where I did my last special, That’s What I’m Talking About, in Seattle, at the Moore Theatre. I like the Chicago Theatre. I was in New York not long ago at the Bowery, and I was also at the Music Hall of Williamsburg in Brooklyn. I can't really pick one. People are great and different everywhere you go. From my perspective, that’s the nicest part of being a live performer. You get to see the better side of people. Usually criminals don’t come to my shows. Saget’s book, Dirty Daddy, is available now from It Books. Find national tour dates here. Photo provided by Bob Saget.